Get Bonus Up to 50 DIAMONDS!!!! 50,000 GOLD!!! 25 Cards IN 5 DAYS!! Just play and get all of these everyday!! 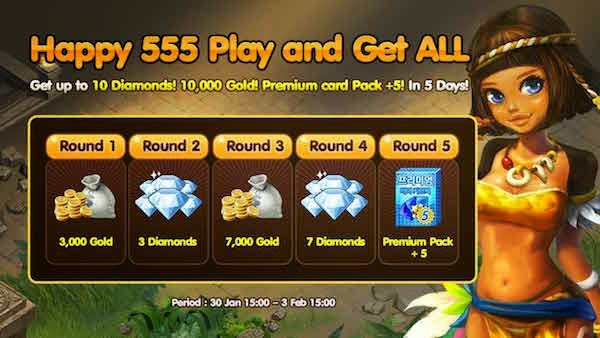 Dapatkan Bonus s/d 50 DIAMOND!!!! 50,000 GOLD!!! 25 Card dalam 5 HARI!! รับสูงสุด 50 เพชร!!! 50,000 ทอง!!! 25 การ์ดพรีเมียมใน 5 วัน! !